HomeMaccaferri installs a Gabion system into an ore deposit. Maccaferri installs a Gabion system into an ore deposit. Maccaferri’s Gabion system provided the best possible solution for the Mikheevsky copper-porphyry ore deposit construction work. The Mikheevsky copper-porphyry ore deposit situated in the Chelyabinsk region in the Russian Federation, is one of the largest copper deposits in Russia. The International Independent Analytical Consulting group CRU has included it in its list of the 50 largest copper deposits in the world. The Copper-porphyry ores of the Mikheevsky deposit contain copper, gold and silver. Useful ore resources will reach 400 million tons. 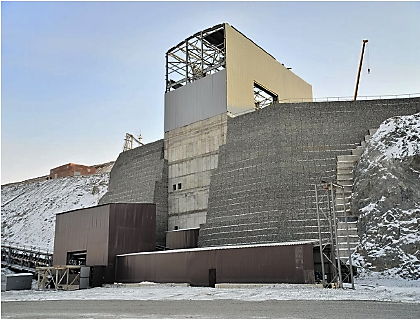 The Mikheevsky ore dressing and processing activities required a 30-meter high retaining wall that would support crushing operations and an approach road on which heavy load trucks would regularly operate. The traditional solution of reinforced concrete was deemed cost prohibitive given the number of man-hours required and the high transport and operations costs associated with the erection of such a structure. After thoroughly evaluating the situation, Maccaferri proposed a Gabion CIS solution for various apparent reasons. First off, the solution offered a viable alternative answer in the form of a reinforced retaining wall made from Terramesh strengthened with ParaGrid 200 and ParaLink 500 geogrids. On taller slopes and structures Terramesh can also be used in conjunction with our high-performance primary geogrids, ParaLink, ParaGrid and MacGrid WG, thus making it a multifaceted, and customizable solution. Secondly, the preliminary design stage optimized the wall placement, which ensured overall dimension integrity of the area at the upper level while allowing for flexibility in the facing angle from the use of the Terramesh system. The retaining was constructed as three sections with each section 10 meters high. Two-meter-wide berms separate the parts and reinforced concrete blocks were used to complete the junctions. The application of a soil reinforcement system made it possible to use local building materials (rock) and to minimize the expense of cast-in-situ reinforced concrete. For further technical information, please download our Case History.